New Orleans police officers on strike during Mardi Gras 1979. In ‘79 the city’s organized Carnival helped save the city by sacrificing itself. This was the year when the New Orleans police went on strike. Union organizers used Carnival as a wedge. Had their demands been met the city would have been nearly bankrupted and also lost much control over the department. Mayor Dutch Morial strongly opposed the strikers’ demands. 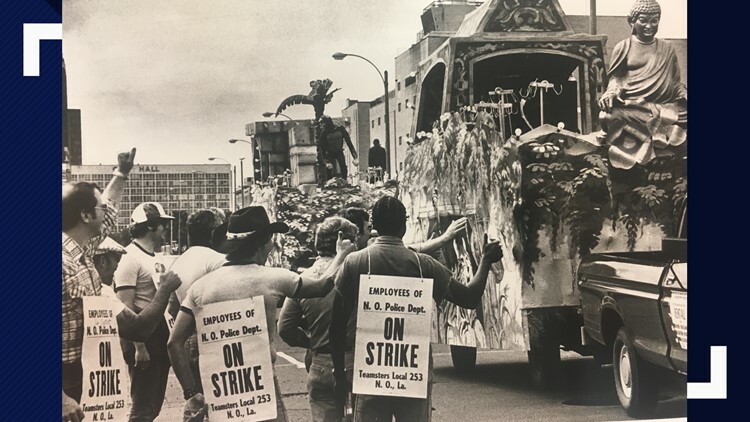 In one historic moment the captains of the krewes stood together with the mayor saying they would “not be held hostage by the Teamsters Union.” All the parades in New Orleans were cancelled that year but on the day after Mardi Grad the strike, having lost its leverage, fell apart. Carnival day was nevertheless a festive period as masked revelers romped in the French Quarter without the need of a parade. Had there been no Mardi Gras in New Orleans there would have still been a strike, but the strikers miscalculated the civic responsibility of Carnival’s leadership. The celebration that the strikers conspired to hold hostage instead showed the city’s resolve to stand firm. On January 7 of that year, a sniper opened fire from the top of a downtown hotel. Over the next 24 hours several people, including police officers, were killed. Ultimately, the sniper was gunned down from a helicopter, but even as his corpse was still on the roof there was uneasiness that the incident, which took place during a time of unrest in the nation, was part of a widespread conspiracy. Because the sniping took place on the second day of Carnival season, there were concerns that the parades should not be held that year. Those concerns were not answered. The parades were held, and nervous citizens regained confidence that they could walk the city's streets and stand on its neutral grounds in safety. Mardi Gras that year helped the city believe in itself again. On its cover that year, New Orleans Magazine described the then upcoming carnival as “The Most Important Mardi Gras Ever.” We still believe that. Not only was Carnival that year the first after Hurricane Katrina, it was also the first major event in the city since the storm. Despite the curmudgeons and nay-sayers (which at one point included the then mayor) who said the parades should not be held, to the contrary the krewes needed to go before the public more than ever. With the world’s media camped out on our mildewed steps, for the city to have not celebrated Mardi Gras would have triggered a message that New Orleans was so down and out it could not even stage a parade. Those anxious to proclaim the city’s demise could have made their case. Instead, by staging the parades, albeit it in abridged form, the message went out that there was indeed life in the city and it was coming back. Mardi Gras 2006 gave the world the first meaningful sign of the city’s recovery. It is not irrelevant that it also helped lift the spirits of locals, who were badly in need of reason to believe again in their town. As another Mardi Gras begins may the season work its blessings, and may the nay-sayers join the revelry, put on a mask and, most of all, open their eyes to the season’s potential.